Mark 12:38-44 38 As he taught, he said, "Beware of the scribes, who like to walk around in long robes, and to be greeted with respect in the marketplaces, 39 and to have the best seats in the synagogues and places of honor at banquets! 40 They devour widows' houses and for the sake of appearance say long prayers. They will receive the greater condemnation." 41 He sat down opposite the treasury, and watched the crowd putting money into the treasury. Many rich people put in large sums. 42 A poor widow came and put in two small copper coins, which are worth a penny. 43 Then he called his disciples and said to them, "Truly I tell you, this poor widow has put in more than all those who are contributing to the treasury. 44 For all of them have contributed out of their abundance; but she out of her poverty has put in everything she had, all she had to live on." 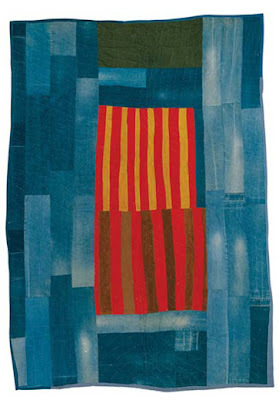 In 1998, art collector and historian William Arnett was working on a history of African-American vernacular art when he saw a photograph of this quilt, by Annie Mae Young draped over a woodpile. He was so impressed that he determined to find it and finally showed up unannounced at her home in Gee’s Bend, Alabama with his son Matt. She had burned some quilts the week before – cotton smoke drives off mosquitos – and wasn’t sure if she still had it or not. She found it the next day and offered it to Arnett for free. He insisted on paying her a few thousand dollars for that one and several others. And, he took them to an art museum in Houston, convinced them to exhibit these quilts, and formed the nonprofit Tinwood Alliance to help the women market their quilts, now selling for more than $20000 each. This island community lost their ferry during the Civil Rights movement. The sheriff reputedly explained, "We didn’t close the ferry because they were black. We closed it because they forgot they were black." The community’s dominant realities were church, debt and hard work, hunting possum in the winter, scratching out a few crops in the growing season, and making quilts with worn out clothes and scraps from the sewing factories. Arlonzia Pettway, 83 years old, says, "I came through a hard life. Maybe we weren’t bought and sold, but we were still slaves until 20, 30 years ago. The white man would go to everybody’s field and say, ‘Why you not at work?’ What do you think a slave is?" (Wallach). "Watch out for the teachers of the law. . . . They devour widow’s homes and for a show make lengthy prayers" (Mark 12:38-40). In this section of Mark, we have, back to back, a condemnation of religiously defrauding widows and a widow whose generosity overwhelms us. But it is right for us to start with the first story, because it exposes for us all the worst things that religion can be. There is no need to go through the whole list . . . we don’t have enough time for all the evil things that have been rationalized with Scripture. But we have this phrase: "They devour widow’s homes and for a show make lengthy prayers. Such men will be punished most severely." We’re not that far from the public scandals of religious leaders who enriched themselves at the expense of widows on fixed incomes. We remember the rage, the indignation, we felt. We remember with horror the way the sacrificial gifts of so many were dishonored by a few. It is nice to know that Jesus shares our outrage. Jesus is outraged when religious leaders dishonor gifts given to God. Jesus is outraged when people are taught, expected, demanded to give in a way that impoverishes them or forces them into debt. (In fact, the main categories of money-management instruction in the Bible are to get OUT of debt and to give.) Jesus is outraged when people are urged to give with the false promise that they will only receive more in return from God. Sure, we have the story of the widow at Zarephath and her unending supply of oil and flour. But the widow in this story gives everything and receives no such solace. When we give, the only thing we know for sure is that we’ll have less money. God is gracious and does surprise us – I’ve certainly been surprised from time to time with the way God has supplied – but giving to God comes with no guarantee of money in return. When Martin Luther King, Jr. came to town, he said, "I came over here to Gee’s Bend to tell you, You are somebody." But it wasn’t until William Arnett, who got labeled early on as "the crazy white man . . . paying good money for raggedy old quilts" ... it wasn’t until William Arnett showed up that these women discovered their gift, their wealth. Now, they think of themselves as Artists. 46-year-old Louisiana Bendolph designs her quilts on paper, but her 11 year old granddaughter uses a computer. She says, "We think of inheriting as land or something, not things that people teach you. We came from cotton fields, we came through hard times, and we look back and see what all these people before us have done. They brought us here, and to say thank you is not enough." Her great-grandmother, Mary Lee Bendolph, picked some pecans to make candy for the kids. She sat down to soak her feet and smiled. "I’m famous. And look how old I am. I enjoy it" (Wallach). Do you think the widow in Mark’s story had any idea she’d become so famous? Maybe someday she and Mary Lee will get to make pecan candy and soak their feet together. Two lepta, two coins worth much less than our pennies, two cents worth. But worth so much more. One thing for sure: They don’t burn any more quilts to keep mosquitos away! There’s no such thing as a "raggedy old quilt". "I tell you the truth, this poor widow has put more into the treasury than all the others. They all gave out of their wealth; but she, out of her poverty, put in everything – all she had to live on" (Mark 12:43-44). When the Apostle Paul complained to God about his physical infirmity, God’s response to him, in his specific situation, was a reminder of a universal truth: "My grace is sufficient for you, for my power is made perfect in weakness." Paul goes on to comment, about Jesus, that "he was crucified in weakness" (2 Corinthians 12:9 and 13:4). Whether or not it is ever noticed, there is a great power present in the women of Gee’s Bend, in the widow at the temple treasury, and in our own weakness. Every one of us has a gift; don’t minimize your own. As Martin Luther King said, "You are somebody." I can say it until I’m blue in the face, but that gift is not usually discovered because of a preacher. It takes a guide, someone willing to pay good money for raggedy quilts, someone who helps us discover that we are an Artist. "There are different kinds of gifts, but the same Spirit" (1 Corinthians 12:4). It is our goal here at Bethany to help individual people uncover their gifts. It’s not a simple process and every story is different. But there is nothing like living out your destiny, becoming all that you were designed to be, discovering your gift. Talk to me if you are interested in knowing more. Get out of debt. Debt is not just the biggest obstacle to generosity. It is also the biggest obstacle to becoming all we can be, to discovering our gifts. Being out of debt gives us incredible freedom. And, if you need some insight in this area, let me know and we can help. The mathematics of giving. Sometimes we measure gifts by their actual amount: $1million goes much further than Two Cents. But it is obvious that God’s economy works a bit differently than that, so some other measure must be applied. We turn to the tithe, the 10% giving benchmark that shows up throughout the Bible. It is proportional to income and can apply effectively to many people. But, if we’re making the money of a top tier pro athlete, that 90% share goes a lot further than 90% of minimum wage. Jesus says that the widow gave more than ALL the others – not just the rich who were throwing their money around in public. Why? Because everyone else gave out of their abundance, their extra. The widow woman, on the other hand, dipped into her need, her poverty, to give everything, "all she had to live on". Measuring such a gift has less to do with the proportion of income and more to do with the difference between surplus and need. "For you know the grace of our Lord Jesus Christ, that though he was rich, yet for your sakes he became poor, so that you through his poverty might become rich" (2 Corinthians 8:9). Wallach, Amei. 2006, October. "Fabric of Their Lives". Smithsonian, 37:7, 66-75.